Today we publish the first part of a nine-part series on the evolution of the Gateway Mall, that ribbon of park space that runs between Market and Chestnut streets and from the Jefferson National Expansion memorial westward to Twenty-Second Street downtown. 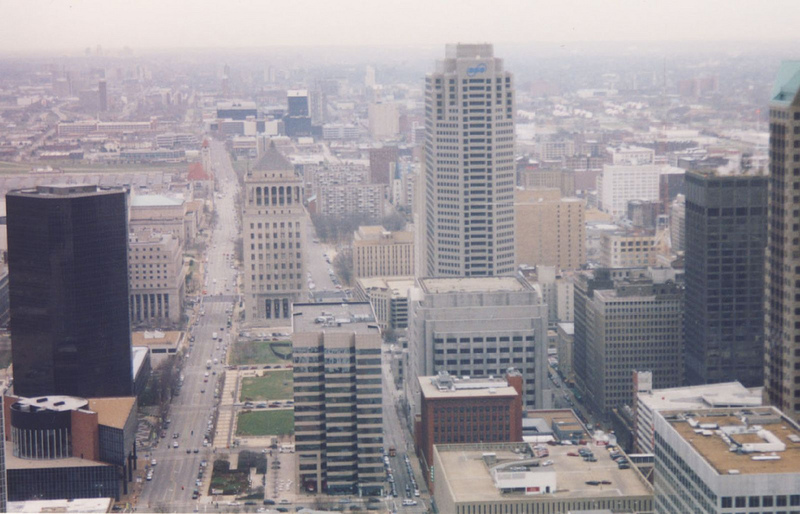 This article began its life as a lecture that I delivered to the Friends of Tower Grove Park on February 3, 2008, and was published in its entirety in the NewsLetter of the Society of Architectural Historians, Missouri Valley chapter in Spring 2011. Let’s review: The Gateway Mall is a line of parks that runs between Chestnut and Market Streets from Memorial Drive west to 22nd Street. Right? Other than the handful of destination blocks, few St. Louisans could readily identify the visual characteristics that define the Gateway Mall. Descriptions of the mall, like the one that I just offered, typically revert to geography. The mall’s boundaries are street names. The mall’s identity lies in what surrounds it, and not in inherent qualities that the user of Forest or Tower Grove parks offers to someone unfamiliar with those spaces. Reliance on a geographic description of the Gateway Mall is quite gentle, because to enumerate what the mall contains hardly portrays an attractive green space. We have a jumble of mismatched blocks, from the passive formal parks across the street from City Hall to the postmodern ruins of Kiener Plaza to the sunken garden between the Old Courthouse and the Arch. We have monumental blocks like Aloe Plaza and the Richard Serra sculpture block that lose all of the drama of monumentality by being placed alongside interceding dull blocks of dead park space. We have interruptions like the Civil Courts and the Old Courthouse, a fairly pleasant juxtaposition if only there were not a poorly-wrought 1980s standing between the two. Some blocks are wide, some are narrow. Some are standard length and others form smaller super-blocks. The whole mall is almost hinged around the Civil Courts building, where Market Street bends slightly southwest. That bend precludes true symmetry. The view east from 20th Street. Here the view is pretty much coherent. The Gateway Mall has no historic boundary. That is, its boundaries have shifted under various plans. Originally, it would have extended between Grand and 12th (now Tucker). Later plans had it extending east to meet the Arch. Nowadays, it does start at the western edge of the Arch grounds but ends rather haphazardly past 21st street. The terminus is a chain link fence separating and irregularly shaped block from a highway ramp. The westernmost mall block struggles to make the most of an ugly terminus. The boundaries have changed since first conception in 1907 and construction in the start of 1920s, but we finally have set the boundary. What is the purpose of this boundary? Ostensibly, the purpose is to create an open mall through the heart of downtown St. Louis that is a visual focal point as well as a verdant relief from the dense environment. That purpose itself is malleable, as the history of the mall idea shows. One would not be too cynical to imagine that the purpose of the boundary of the Gateway Mall is to be the boundary of the Gateway Mall. For a park boundary to be significant, it must enclose a green or recreational space that has discernible character. But is it a mall? Historically, examples of European and American park malls like the sober, elegant Commonwealth Mall in Boston or the Paseo in Kansas City, share a linear geometry. Malls like these follow straight lines. There is uniformity in landscaping enforced through symmetrical rows of trees and centered paths, roads or laws. The park mall typically runs through densely-built areas, where it is a clear visual break from the pattern of the city. Malls enhance urban environments by creating wide, open views not found on commercial thoroughfares. In turn, the density of the surrounding built environment provides a mall with both definition and architectural variety to alleviate the monotonous landscape. 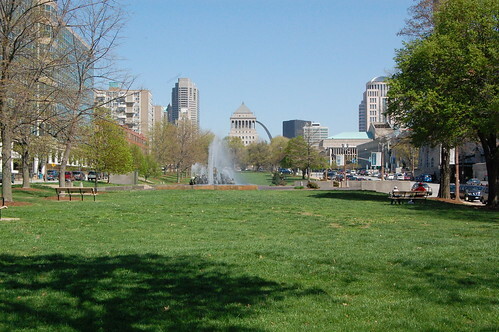 St. Louis' only true linear park is St. Louis Place Park, depicted here in Pictorial St. Louis (1876). From the earliest concept, our Gateway Mall was obviously supposed to be both a park and a mall. The early plans show a mall that would have undoubtedly met Turner’s criterion for boundaries and would have created a unique, beautiful American landscape. The challenge set by our city leaders 100 years ago was to introduce park space into the central city. 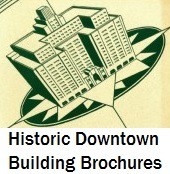 Downtown in 1907 was a densely-built environment where uses frequently collided into each other — modern office buildings, small factories, narrow storefront buildings with tenements above, grand government buildings, seedy hotels, fraternal club houses, churches and schools all stood in the Central Business District. There were almost no open spaces downtown. The market did not allow for open space. The city still was a walking city, and density was the key to economic livelihood. Businesses needed workers to live nearby; those workers needed housing, markets, schools, taverns and churches. Downtown at the turn of the century was “mixed use” without much urban planning. This was spontaneous order, to borrow a phrase from economist Friedrich von Hayek. The market put all land to use in this economy. 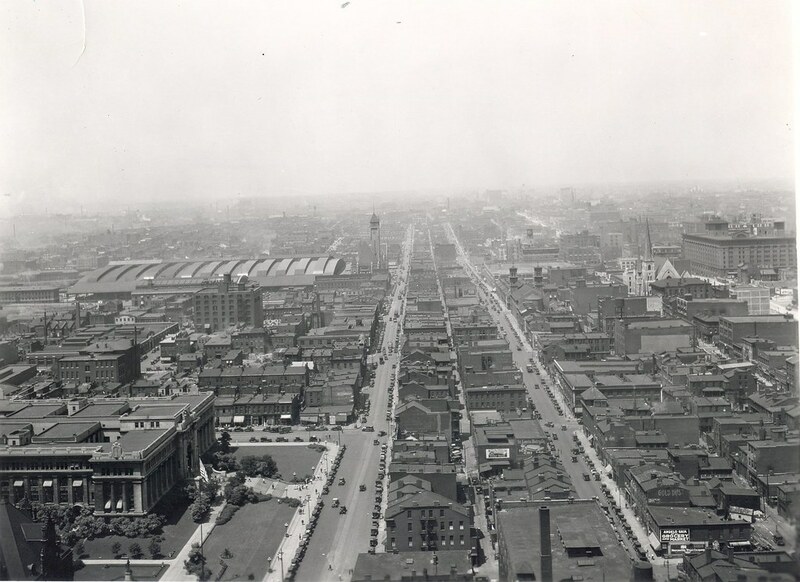 Yet city leaders wanted to start planning the downtown area — a tall order that entailed altering fundamental patterns of economy and settlement. Lafayette Square depicted in Pictorial St. Louis (1876). By 1907, the relationship between the movements for urban planning and park creation were conjoined. Early park advocates in America embraced a romantic vision in which the virtues of recreation and time spent in nature were seen as counterbalance to the supposedly degenerative moral and physical effects of urban living. These advocates favored creation of large open spaces in cities that would imitate natural wildness within planned confines. They argued that romantic landscaped parks promoted public health, economic prosperity and social coherence. 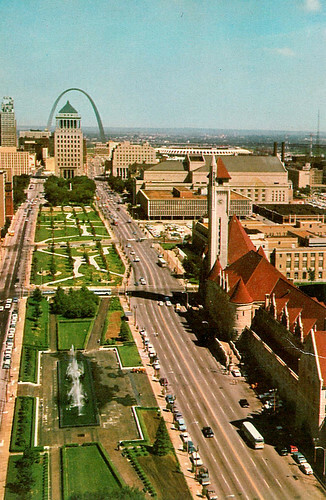 Proponents of early parks in St. Louis were in this romantic tradition. In 1836, a city ordinance set aside nearly 30 acres of the city Common Fields south of downtown for use as a park. 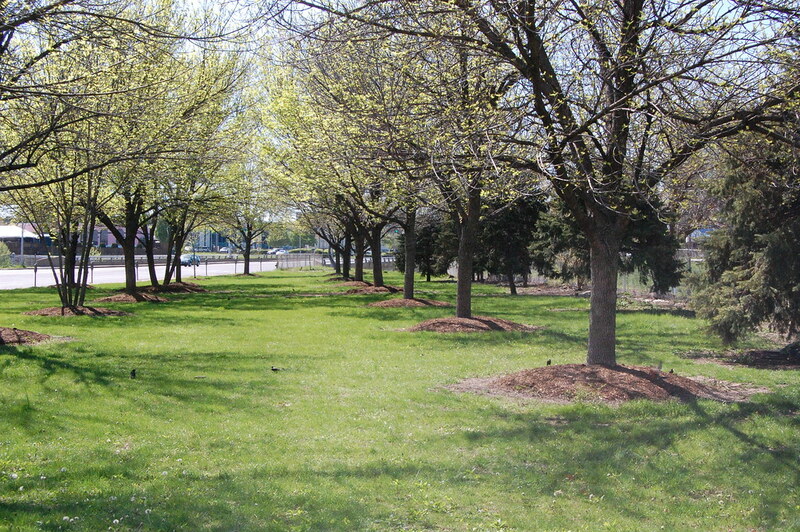 This land would later be dedicated as Lafayette Park in 1851. In 1840, Greenwood Cemetery in Brooklyn, New York, introduced a pleasure park that was essentially America’s first landscaped public park. 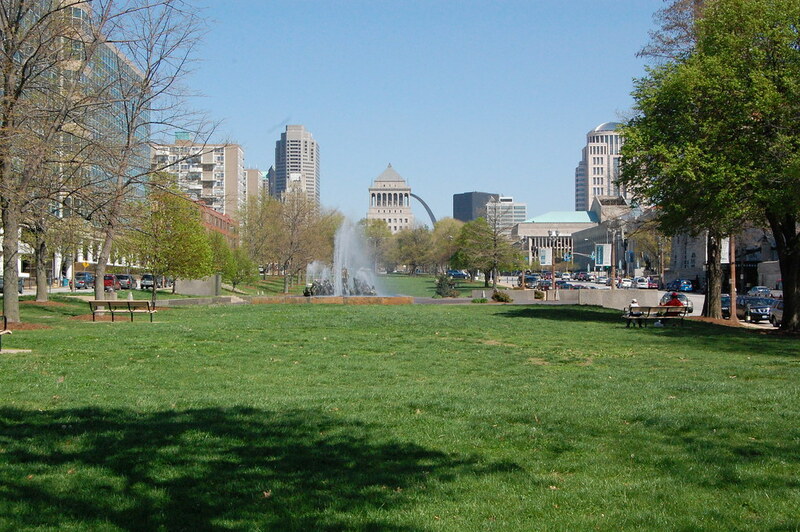 St. Louis created its first city parks in the 1840s and 1850s: Carr Square and St. Louis Place on the near north side and Washington Park downtown. After 1872, as we all know, the city embarked upon its most ambitious park creation project when it creates Forest Park, O’Fallon Park and Carondelet Park. These parks are all large landscaped parks in the romantic tradition. Their creation initially seemed radical because the three parks were located in still-rural parts of the city. However, within thirty years all three parks were surrounded by neighborhoods and widely used. These three parks represent the intersection of progressive planning and romantic ideals. They served the purpose of setting aside landscaped green space to create transformative beauty to benefit the minds and bodies of all citizens. Yet they also fulfill the need to create public amenities for further private development of the city. In the 1880s, park advocacy moved to a rationalistic tradition. The ideals of controlled wilderness, egalitarian social reform and public health fell in favor of more scientifically-tinged ideals of social order, prescribed recreation and aesthetic formalism. Rationalists warned of the ills of unbridled nature, and certainly did not see it as a cure for social ills. To the rationalists, wild nature was as much the problem as crowded urban living. The cure for both lay in social and physical engineering – the triumph of the human mind over undesired circumstances. The park movement’s change was mirroring that of urban politicians, and both were assuming a reactionary posture. Urban overcrowding, disease, child labor and poverty were becoming large problems for American cities like St. Louis, and their defeat was urgent. Reformers still viewed parks as an important curative measure, but not just any old parks. The park space must be as disciplined as society needed to be, and rather than gently lead people to social betterment must impose upon them order. This entry was posted in Downtown, Gateway Mall, Parks. Bookmark the permalink. That view looking west over Chestnut Valley from 1930 is utterly painful. Had these buildings been preserved, it would undoubtedly be a prized neighborhood today, a la New Orleans’ French Quarter. The most successful urban neighborhoods are not planned. I much agree with the previous commentator — it’s painful. I hope in the succeeding articles you develop the relationship (if valid) between the construction of the Gateway Mall and the destruction of Mill Creek Valley.